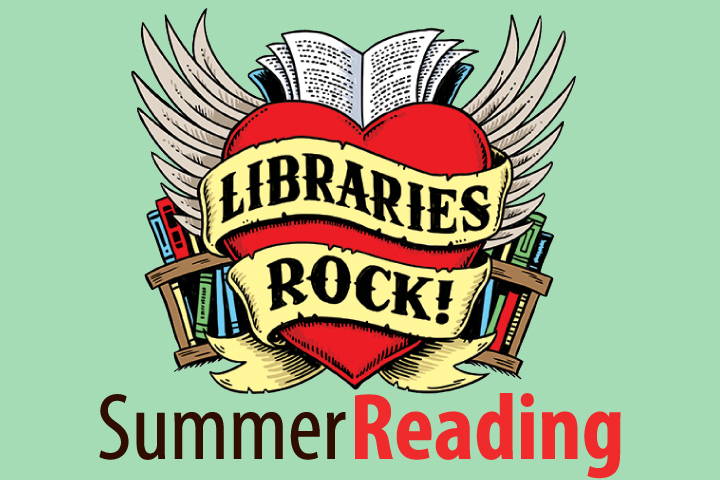 DPL - Hey Kids, Libraries Rock All Summer Long! This summer Deschutes Public Library offers a range of fun programs for children and families that will help keep brains and bodies rockin’ all summer long! Join us at the library this summer and help your child avoid the “summer slide”—the tendency for children to lose some of the achievement gains they made during the school year. Kids can play the Libraries Rock! reading game for a chance to win puppets, science kits, a family membership to the High Desert Museum and a bicycle donated by the Bend Masonic Lodge. (Game sheets are available at your local library.) All programs are free. Programs marked with an asterisk require advance registration (www.deschuteslibrary.org/events). What’s that sound? When we think of music, we often focus on instruments, singing and dancing. But let’s not overlook the natural world, which offers up a plethora of interesting sounds to explore. We will play animal-sound bingo and animal-sound guessing games, learn about layers of sound in nature and even make our own “rattlesnake” tail rattle. Rock art, such as ancient petroglyphs and pictographs, has been used to communicate for as long as humans have been around. You’ll explore the history, learn about the modern phenomena known as the Kindness Rocks Project and make some rock art of your own. Then you’ll play mancala, an ancient game of Africa and Asia. Calling all prospectors, and rock hounds! Learn how to pan for gold just like miners from the mid-1800s—without all the fuss of wading through streambeds and blasting through bedrock. You may strike it rich! This hands-on science program will demonstrate simple gold panning techniques and provide an introduction to geosciences. Registration required. From Oregon’s state dance to the Caribbean limbo, join us as we shake, rattle and roll! Come learn about different dances from around the world and make a rhythmic instrument to help you keep the beat. Did you know that dancing makes you smarter, happier and more connected to your community? Join in the fun at Dance-a-palooza! In this puppet show based on an African folktale, Anansi, the master trickster, uses a magical rock to deceive his friends. But will Anansi's trickiness catch up to him? We probably won't find a magical rock like Anansi's, but we'll also explore some different rocks found in our area and take a look at the hobby of rock hounding. Kids will make their own special “Anansi rock” to take home. Storytelling and camp songs combine for the whole family to enjoy a concert that rocks with music and participation, followed by a craft. Third generation storyteller Heather McNeil and her autoharp will entertain all ages with stories that include songs, and songs that include stories. Bring your hands to clap, your mouths to join in, your body to act out, and your creative talent for a craft. It’s $2 Tuesday and the library is inviting baseball and book lovers to celebrate Library Night with the Bend Elks as they challenge the Victoria HarbourCats. Show your library card and get in free! Win free books and other prizes. Have you ever wondered how hard is it to play drums? Or how to strum an autoharp or pick a banjo? These are some of the questions that could be answered during this petting zoo. You won’t meet animals, but Cascade School of Music will introduce you to a variety of musical instruments and show you how to play them. Students from High Lake Elementary will perform music on the amazing marimba. The marimba is a percussion instrument consisting of a set of wooden bars that are struck with mallets to produce musical tones. There is no other sound quite like it! 123 Andrés is a family concert full of joyful sounds, bilingualism, and high-energy singing and dancing in Spanish and English. Andrés Salguero is considered “a rockstar for little language learners.” A native of Bogota, Colombia, Andrés demonstrates a passion for music that he has felt since age eight. He plays multiple instruments, and received the Parent’s Choice Gold Award in 2016.